Generously butter eight ramekins measuring 3-3/4 to 4 inches x 2-1/2 inches [10 to 10.5 cm x 6.5 cm]. Cook onion in 1 tbsp [15mL] butter over medium low heat in covered fry pan until onion is cooked and translucent; cool. Mix together raisins, dates and pecans. Set aside ¼ cup of the mixture for later. In a large bowl, mix together cheddar and onion, the remaining raisins, dates, nuts and cubed bread. Beat together cream, eggs and mustard. Sieve mixture and pour over bread mixture let sit for 30 minutes. Divide mixture between ramekins. 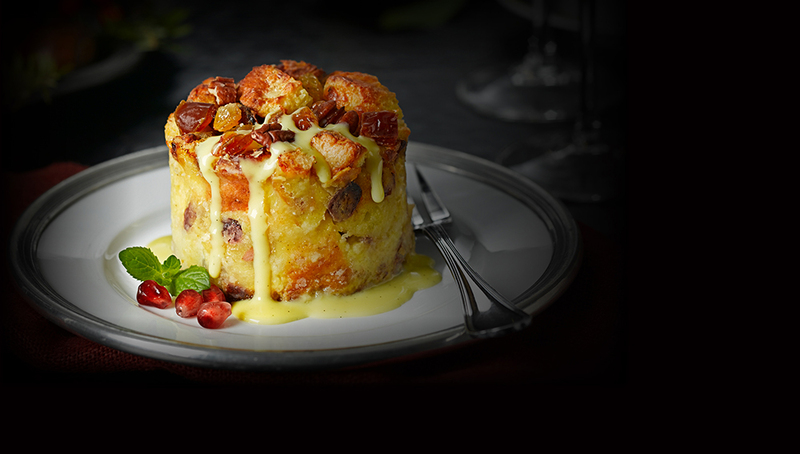 Sprinkle the remaining raisin and nuts on top of puddings. Place ramekins on a baking sheet. Bake at 350°F [180°C] for 20 to 25 minutes; cool for 10 to 15 minutes. Run a sharp knife around edge of each ramekin to loosen pudding before un-moulding onto individual plates.